Dimension: 24" x 36", 24" x 48", 36 " x 48"
Screen printing demands high density, high resolution and accurate outputs. Fabric tension plays an important part in achieving the desired results. GF 150C/GF 250C is specially designed to achieve perfect fabric tension. - Frame Size: 48" x 64", 64" x80". 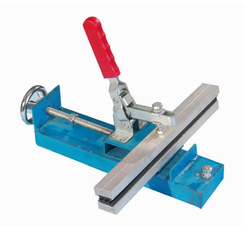 80" x 120"
fabric stretcher: fabric stretchers are available in screw design as well as chain design. Also option is available for motorised as well as manual type. The stretcher ensure constant tension in the fabric. The stretcher have the provision for seam straighteners. - Max. Screen Frame Size 24" x30" & 34x"44"
- For high quality screen and easy working process. - Separate stretching of fabric in wrap and weft directions. - Frames can stretched parallel or angled to wrap/ weft direction. - Large screen or multiple small frames stretching possible. 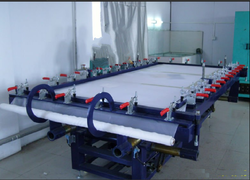 Available Frame Size: 20"x25", 30"x40", 40"x60", 60"x80", 80"x130"
We are one of the leading supplier of Fabric Stretching Machine. To cater the variegated needs of our esteemed customers, we are highly engaged in offering a wide array of Cloth Stretching Machine. M S fabricated structure with mechanical lifting and width adjustment for maximum screen size outside 60 inch width and 1 meter repeat. Wider machine on request. In order to keep pace with never ending demands of clients, our company offers Fabric Stretch System. Balaji Industrial Sewing Machine Co.